Bruce Tomb has been a long-time supporter of street art, mostly via postering, along the ever-changing Valencia Street corridor. 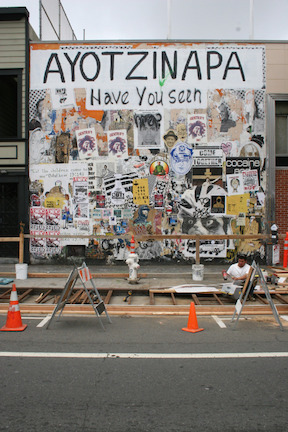 On the wall of a former police station, the (de)Appropriation Project has been a vibrant source of stencils, posters, and political and personal expression. I have heavily documented it over the years, putting some photos in Stencil Nation and labelling my photos with "dap" when I put them here on the Stencil Archive. Tomb's wall is a special wall: legal, unedited (unless you don't like the commercials ads that sometimes get put up on there), encouraged, and community-supported. As waves of change hit the Mission District, knowing that there is a solid spot to paste up on and enjoy is a beautiful thing. This parklet is distinct in that it is also a public art work sited in front of the (de)Appropriation Project. The parklet will take the form of a sidewalk “bulb-out” and two speakers’ podiums. The laser cut step plate for the podiums will also act as signage for the project as required by the Planning Department and the expanded steel mesh will be welded into the form of the podiums. This mesh is the same as what was used to fortify the former police Mission Police Station in 1970, protecting it from the community it served. That mesh has been repurposed and now is the front gate to our building. The custom formed curb will be stained to match the repurposed steel decking from another parklet in the neighborhood that was removed last year. On a wall just inside the building formerly known as CELLspace, an artwork delivers a defiant message: "NOT for Sale!" But the message is a lie — the building, whose exterior walls once featured some of the best street art in San Francisco, was sold and is slated for development. Last summer, two volunteers — artist Russell Howze and art editor Annice Jacoby — took down much of the outside art and put it in storage for temporary safekeeping. What's left on the walls are stickers, tagging, and remnants of art — including faces of Native American men, a monkey with a sign imagining a battle between two well-known street artists ("Hektad vs. Banksy"), and an impressive work by muralist Joel Bergner. Even in its current state, 2050 Bryant's art potpourri inspires passers-by to take photographs for posterity. But what about the art that was taken down? Howze, whose own CELLspace work is among the preserved art, and Jacoby are trying to find a patron who will buy the works and display them again. The art includes Bergner's De Frontera a Frontera, a lyrical, red-splashed work about haves and have-nots in the Dominican Republic, and Icy and Sot's collaboration with Regan "Ha Ha" Tamanui, Super Hero with Portraits, which has a caped boy standing alongside a gallery of orange-tinged smiling faces. Thanks to: Josiah, Josh, Brooklyn Street Art, Antonio. Tunes by: the great late, Daevid Allen, compliments of Radio Gnome from the Planet Gong. Shadows will not stop spring from coming! For now, have a few photos of stencil art with the changing climate. Thanks to all the folks who continue to support and submit to the Stencil Archive! The Mission, Clarion Alley, and on Valencia St.